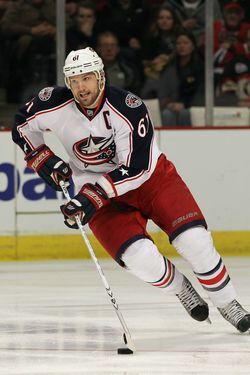 Larry Brooks reported yesterday that the Rangers are once again engaged in "a high speed pursuit" of Rick Nash, who, you'll recall, was also made available at the trade deadline. You can read the details of the situation here, but essentially, they're not all that different than they were back in February: According to Brooks, Columbus is still asking for a big haul, including winger Chris Kreider, whose stock only rose during this year's playoffs. Brooks reports that up to a half-dozen teams might be in the race for Nash, and that while he'll be shopped this week in advance of the Draft, this could all last into July, once free agency begins and teams can fill holes on the open market. There have always been two things in play with the Nash talks: One is simply adding his huge contract, which Brooks reports has never been an issue for Sather. This isn't totally surprising: Like we wrote when the Rangers' season ended, now that their window to compete for a Cup is open, they don't need flexibility for flexibility's sake. If there's a player they think is worth spending money on, they're probably going to pull the trigger at this point. We're not saying that Nash is that guy, and they'll need to choose wisely if they're going to target someone who will take up some serious cap space. But in any case, the money isn't the real issue here. The bigger hold-up has always been the Rangers' understandable hesitation to give up too many assets, or, more accurately, to give up too many of their most prized assets. If Columbus insists on Kreider being a part of the deal, one imagines it won't happen. The Rangers might be willing to discuss certain names — Brandon Dubinsky, for instance — but Columbus's reported asking price as always been far too high. The Rangers need scoring, but not at any cost. Brooks wonders in his piece whether Sather will look at his roster, see that some of his top players (Henrik Lundqvist, Ryan Callahan, Dan Girardi, and Marian Gaborik) can become unrestricted free agents two summers from now and decide to make a bold move, like Dean Lombardi of the Kings did in acquiring Jeff Carter. (Carter, of course, wasn't the only reason the Kings turned their season around, but his point is well taken.) Or to put it another way, the Rangers' window of opportunity might have just recently opened, but might Sather sense it could only be open for two more years, and if so, does that change how he does business? We're not so sure. The Rangers' window won't be open forever, but it won't necessarily close in two years. After all, just because they're free agents, guys like Lundqvist, Callahan, and Girardi won't necessarily leave, and while Brad Richards will turn 34 in 2014, a host of other players will still be in, or just entering, their primes. The Rangers might not have unlimited chances to win with this team, but they don't necessarily have just two more. Which brings us back to the Nash Watch. Are the Rangers more desperate for scoring, having seen what their offense looked like in the playoffs? Probably, at least a little. (It's here we'll remind you that Marian Gaborik played hurt in the postseason, but where we'll also remind you that the team, as it's presently constructed, isn't really capable of absorbing the loss of a key scorer.) The way Brooks puts it, Sather isn't worried about about Nash's contract. If he pulls the trigger for Nash, he'll be hoping that he's the final piece — or one of the very final pieces — of a real contender. But while fans in the salary cap age are savvy enough to understand what bringing in a contract like Nash's means, we don't think his cap hit is the biggest reason fans chanted "We don't want you" when Nash played at the Garden just before the trade deadline. They'd heard the reports of what Columbus wants in return, and understood it was too much, to say nothing of their appreciation for the team's homegrown core. Sather isn't going to hold on to certain homegrown players simply because they were developed within the organization — to a G.M. looking at dollars and cents, the bigger appeal of such guys is that they cost less for the first several years of their careers — but there are trades that make sense and trades that don't. So far, the reported Columbus demands have not made sense. Sather might feel some pressure to add a scorer soon, but he shouldn't be desperate. Even if simply signing Zach Parise isn't an option, he shouldn't be willing to go after Nash at any cost. The money might not be an issue to Sather, but the total price still should be.